Tribute To Legends – Sons & Daughters of Guam Club, Inc. 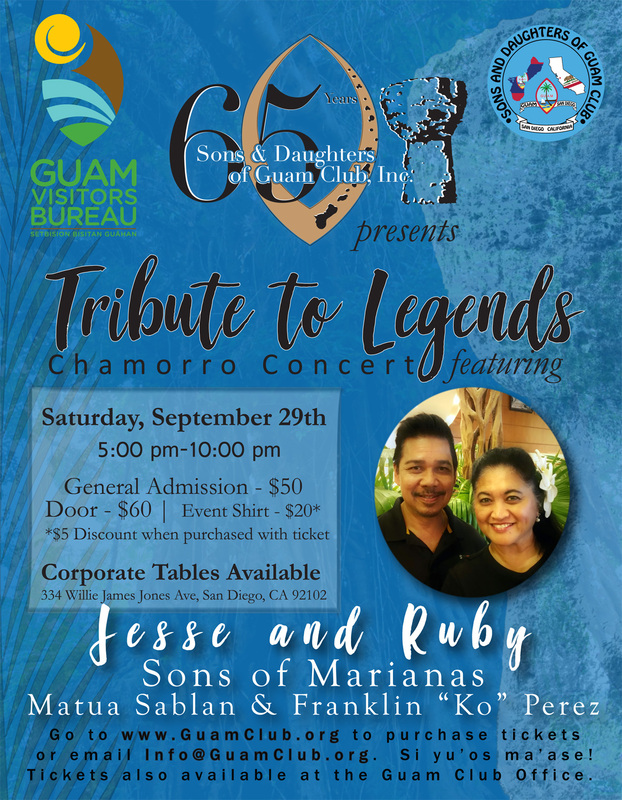 Tribute to Legends Chamorro Benefit Concert. Matua Sablan & Franklin “Ko” Perez. Where: Sons & Daughters of Guam Club, Inc.
Corporate Tables Are Available as well for $650. Contact Jessica@GuamClub.org for more details. All other seats are General type seating. Event Shirts are $20 but are discounted $5 when purchased with a ticket. There is an additional $5 charge for shipping fee if this is the only thing purchased on-line. *65+Yrs can only be purchased at the Guam Club Office. Previous PostPrevious Dale Nesbitt Sr.